Before finding Book Printing UK, DHL CSI did not employ a single solution for their E&M Conferences. Instead they chose to use print shops that were located close to the venue of their conference. Previously, books had been printed for some conferences that did not meet the quality their brand demands. Therefore, in order to standardise the quality, look, feel and pricing across all of their conferences, they sought to find a single solution from a specialist in handling small print runs. 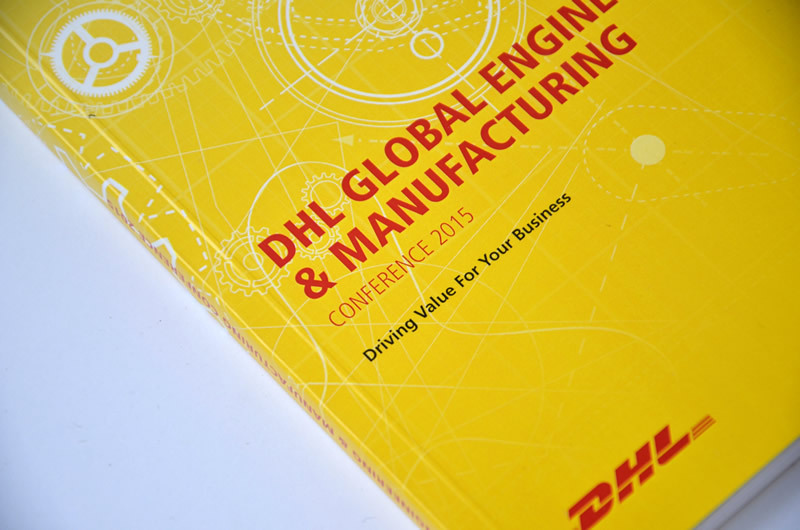 We have worked with DHL CSI for the Engineering and Manufacturing sector on a number of occasions. Our first project involved printing hardback books, booklets, letters and a whitepaper for their Global Engineering & Manufacturing Conference. Since then we have printed hardback books for two conferences in Singapore and one in Miami. The most recent project, for the Global Technology Conference 2016 in Singapore, involved printing books, letters and welcome cards for attendees. The quality is now guaranteed. They can be assured of consistently well printed books, rather than varying standards of quality. We allow them to be more efficient. The process is less time consuming; we do all of the work, and there is a single point of contact. The process is now more cost effective. They are saving money by printing with us. "When you find a solution to a problem, and then your colleagues take advantage of that same solution - then you know that you have made the right decision. It's not only good for my colleagues, but it is good for our company. And this all stems down to receiving a great service from Book Printing UK."